This work was a part WAMSI’s $30 million Kimberley Marine Research Program (KMRP). 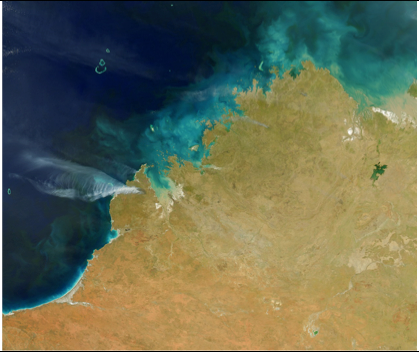 The remote sensing project was tasked with determining if there are cost-effective options for utilizing remote sensing for assisting with long term monitoring, evaluation and reporting of the Kimberley Marine Parks. MODIS-Aqua true colour image of the Kimberley study region ( image date: 24/06/2015). Phase 1 of the project began with a survey of DBCA asset managers, providing a good understanding of the specific metrics utilised in monitoring both the condition of assets and pressures affecting them. We compared the specific requirements of the management agencies with the technical and operational constraints of the various remote sensing technologies that are available. Considering the identified needs of the environmental managers and the potential of remote sensing products and technologies, turbidity and its impact on the in-water light field was identified as the highest priority property to evaluate in the Phase 2 study. 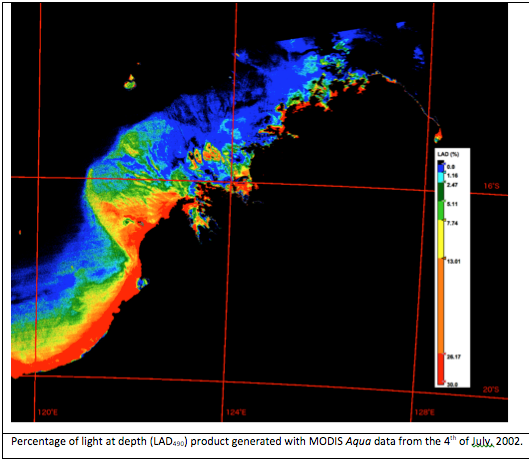 Turbidity affects the transmission of sunlight through the water column to the seabed substrate, with potential impacts on the rates of production for photosynthesizing organisms. We undertook an assessment of uncertainties associated with the remotely sensed products, total suspended solids concentration (TSS) and the diffuse attenuation of downwelling radiation (Kd490 and KdPAR), by comparison with existing in situ data. The regional semi-analytical TSS algorithm of Dorji et al. (2016) performed substantially better than the global empirical algorithm, showing the value of regional algorithms. Following from the analysis of uncertainties, we analysed the 16-year archive of TSS data from MODIS produced with the regional algorithm, to describe the patterns of spatio-temporal variability for Kimberley waters. 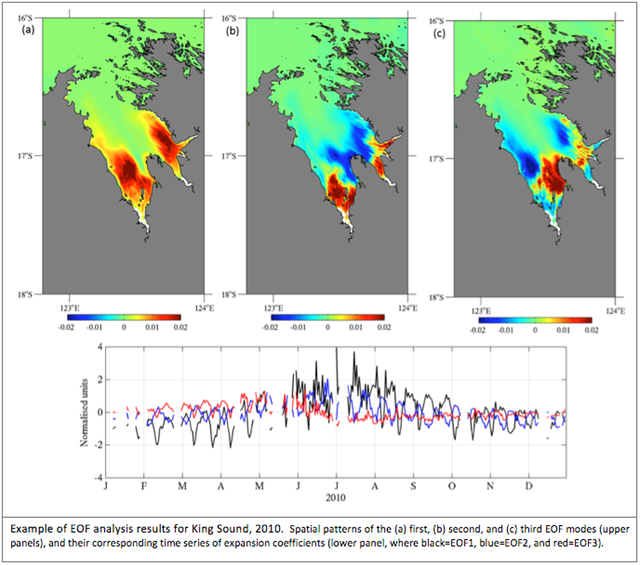 A combination of Empirical Orthogonal Function (EOF) and anomaly analysis identified 6 regions along the Kimberley coast that may be considered different in terms of variability, impact of extreme TSS, and influence of tidal forcing. The analysis also showed that TSS variability occurs on both tidal and seasonal time-scales, with enhancement on spring tides and during the winter months, suggesting an important role for mixing in determining the vertical distribution of suspended sediments. The TSS was used here to infer the water spectral attenuation coefficient, and coupled with bathymetry data, to estimate light levels at the seabed substrate. We also undertook a modeling study to show that the effect of tidal height and phase on estimates of light at the substrate are significant and should be included when determining averaged daily, or longer term, light levels.